Editor(s): Kerschbaum, F.; Wing, R. F.; Hron, J. 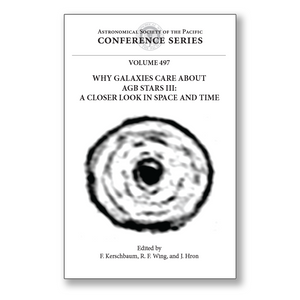 These proceedings demonstrate the relevance of Asymptotic Giant Branch (AGB) stars and stellar astrophysics as a whole for our understanding of galactic structure and evolution. The meeting, a follow-up to earlier ones in 2006 and 2010, brought together astronomers studying AGB stars, galactic evolution, stellar populations and instrumentation. What do we know about the complex physics of the atmospheres of AGB stars? What about their environments? How does being part of a binary system or the interaction with the interstellar medium influence their mass loss properties? How does the AGB mass loss process affect the hosting stellar systems, both on galactic and extragalactic scales? Finally, what new possibilities do recently-developed and future instruments and capabilities offer? These were the main questions we discussed during this conference. This book is suitable for researchers and graduate students interested in stellar and extragalactic astrophysics, the physical processes related to nucleosynthesis, radiative hydrodynamics, stellar pulsation, mass loss, and the chemical evolution of stellar systems. Those looking for recent developments in relevant astronomical instrumentation will also find valuable information herein.